Creating effective input and feedback mechanism has been an important task for blogs and forums. Recently I browsed a tutorialzine post written by Martin Angelov which talks about very unique way of appreciation sytem using Ajax; although this concept is not some thing very new as it available in form of plugin codes from social media sites. 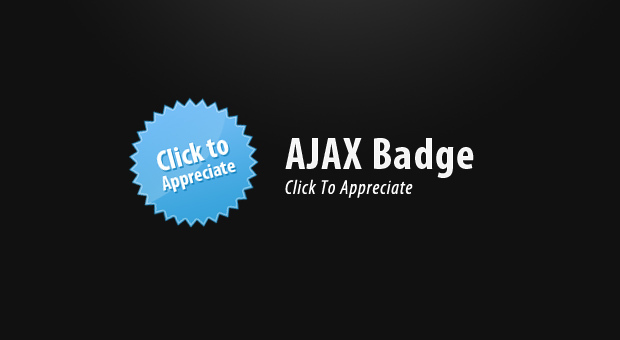 Martin Angelov has very details step by step approach of creating this Ajax Badge.One best thing about this tutorial is that it has been explained using open source. When you publish something online, there are not that many ways to determine whether people like what you have to say. Comments, the cornerstone of blogging, are too demanding, and users often prefer not to post one.So go ahead and create one for your blog.